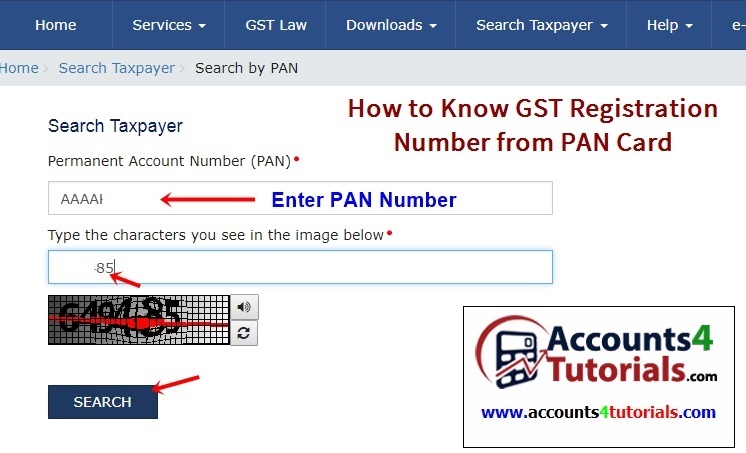 This tutorial helps you, how to get GST Registration number from VAT or CST TIN Number. When GST Return filing, GST Invoice Preparing and GST e-wayill generating etc., you need to know customer/buyer GST Registration number. In the past, you have TIN number of your customer/buyer, but you don't have GST registration number of your customer/buyer. When uploading GSTR-1 (Business to Business), you need to GST registration number of your customer/buyer. For this regards, we have posted this tutorial. Follow the following two steps to know GST registration number from TIN Number. After getting the PAN number, you are ready to know GST Registration Number. > Click on "I Agree" Button"
> If you Know dealer TIN No, Click on "Search By TIN" or If you know dealer CST No, Click on "Search By CST Number"
> Enter TIN Number, then Click on "Search" button. > Now you can see PAN Number. > Click on "Search by PAN"
Now you can view your 11 digits GST Registration Number and Registered State. Note: If More then one or more GST Registration on PAN Number, GST Website will display all GST Registration states GST Numbers. Thank u for ur comment Mr.Gaurav.